Tips for part time PhDers…..how a puppy helped me out! I say this to all my research students, but I think this is particularly true when you are going backwards and forwards between your PhD research and a job or other commitments. You need to really love it, and it needs to have a meaningful output for you. There is no point in doing it if there is no reason other than “I want/need a PhD”. So choose your topic wisely, if you are able to select it. If not, aim your research in a direction of interest. You need to have the PhD thought process happening all the time, despite other things going on – if you hate your topic this will just not happen! I was lucky as my topic was part of my day job, and I think this is something else that really helps the process. The longitudinal process happening alongside my PhD was the establishment of a new vet school, at which I am a foundation member of staff responsible for a huge range of curricular developments, teaching and assessment, not to mention clinical work, helping us get RCVS accreditation and other research projects. 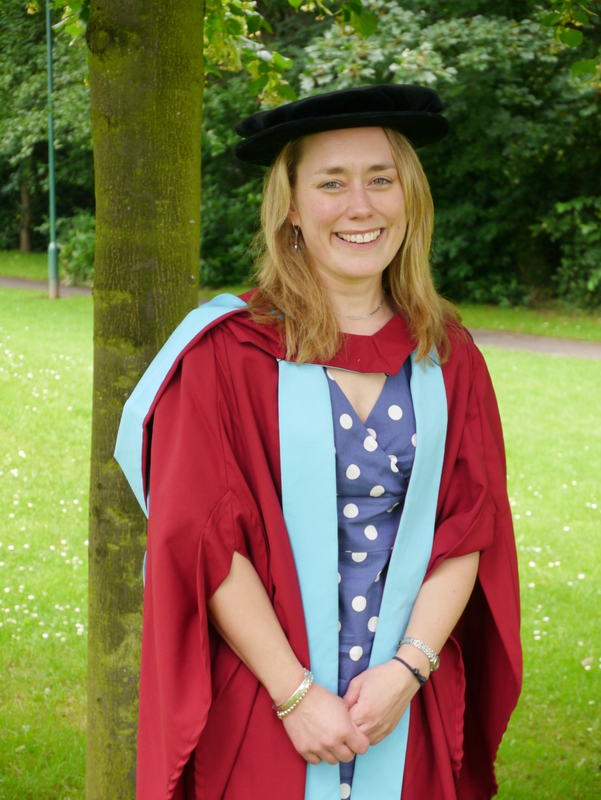 So at times, my PhD stuttered, and coughed, and wheezed and progressed so s-l-o-w-l-y I thought I would never get anywhere! I learnt to ignore it when this happened – I became very good at picking up where I had left off. If you worry then it only gets you down. It was often a relief to get back to it, away from the stress of other aspects of my job…. Proof – I got there in the end! And got to wear a silly hat! The chances are if you are doing a PhD, you have already spent some time in industry or academia and may well be still there. This means you have a lot of skills which someone with less workplace experience may have to develop alongside their PhD research. Don’t forget, the PhD process is about developing you as an academic and therefore if you can already deliver a presentation, communicate difficult topics to peers, negotiate new deadlines, manage a budget, teach, write sentences, and most importantly think critically you are way out ahead at the beginning of the process. This is very good news! In addition, I was lucky in that I was already immersed as an academic in the institution where I studied, therefore negating the finding of the library and learning the names of support staff processes that many students have to tackle. And what’s more, the people around me who knew me well wanted to help – so I could draw on their enthusiasm too. I really only did this in the last year of my PhD. I was lucky that my supervisors allowed me a lot of freedom to develop my research and recognised that they were there for me to bounce ideas off and offer suggestions, rather than tell me what to do! However this independence I had meant no-one chased me and so when I did need comments on drafts, I learnt to manage this process. Generally this meant an email stating what I would send them and when, with a supervision set for 2 weeks after my work had been sent. If there was no supervision, then I would ask for comments within 2 weeks. Done in a diplomatic tone of email of course! As a busy academic, I could empathise with the need for deadlines and these helped both me and them (I think!) 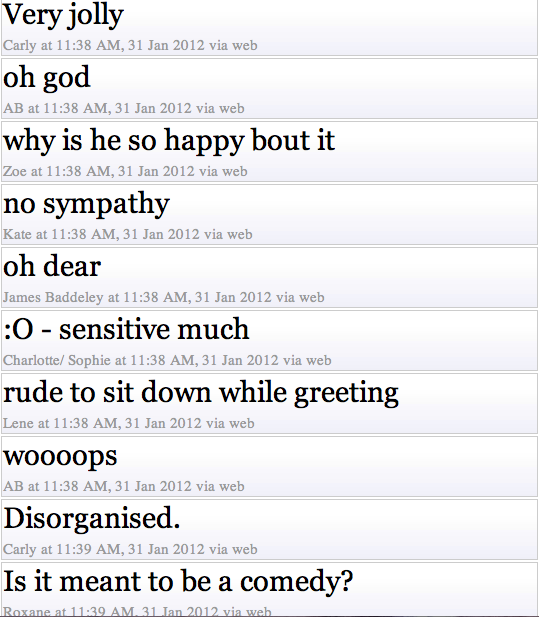 I also asked for a particular type of feedback – e.g. this is a draft and I haven’t checked for typos, could you please comment on content and style? This saved reams of track changes coming back to me, which is unnecessary if you are able to check for your own typos….. I started my literature review in the first few months, and then added to it over the next four years of my studies in an iterative manner. I am always amazed when other postgrads tell me they are starting their lit review and they are a couple of years into things….I know sometimes this happens for a reason, but I found my lit review helped me to focus my research questions and then very much fed into my thoughts. I knew the literature very well (and still do! ), so this helped my confidence in my viva. If you are an academic PhDer then you probably can’t help this, but I really enjoyed other “side” projects whilst doing my PhD. Yes at times they were a distraction, but in general they helped my sanity and have developed me in other ways. So keep an ear out for other bits of research you can get involved in. I discovered Twitter a year ago, and I so wish I had found it sooner! It has totally changed my approach to conferences, and the #phdchat hashtag, amongst others, is very useful. I also follow some interesting people who will answer random questions. Sometimes there are things you don’t want to ask your colleagues, and as a part time PhDer I did not spend much time with other PhD students in my school, nor did I attend lots of courses with other students. But you need a support network, and Twitter has really filled this gap for me. There are also some great forums out there. Google is your friend! Actually my other half bribed me – a new puppy was great motivation 🙂 I would thoroughly recommend this strategy! 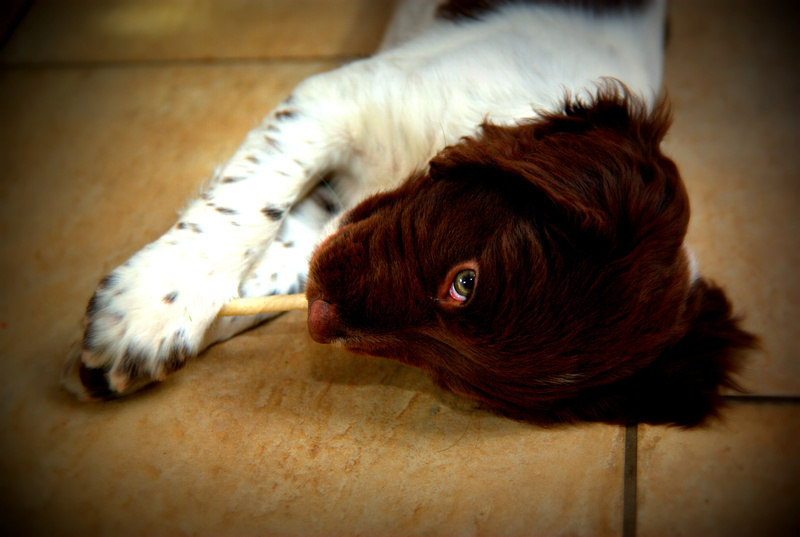 My bribe – Twig the springer! I am currently involved in PublishOER. This is a JISC funded project which is bringing together OER academics with publishers. You may think this is a bit of a strange thing to do – I certainly did! Why on earth would large publishing houses be interested in the concept of OER, when on the face of it students using OER may not buy textbooks because of the free content? And why would we, as institutions producing and using OER, be interested in publishers, when they often make the creation of OER very difficult? 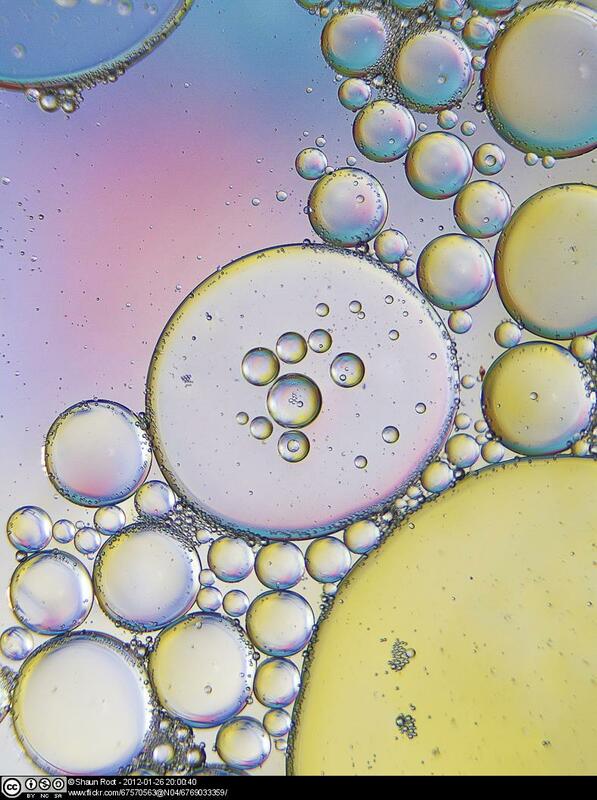 Can we overcome the perceived "oil and water" image of commercial publishers and Open Educational Resources? This is where PublishOER is working to see if a more symbiotic relationship can be developed. What I have realised is that it is in both parties interests to work with the other. Nearly two years ago I sat in a meeting with some small publishers and actually had to explain what Creative Commons licenses are – but this is definitely changing. Publishers (I am talking book not journal) are realising that by “donating” some of their content as OER they are potentially marketing their products. Students get a realistic view of what is on offer, and the possibilities for new iTunes style purchasing are endless. Mobile learning technology is entering the equation which adds another level of engagement. The standard eBook is not necessarily the way forward, as Apple’s iBooks are demonstrating. I am realising as someone who produces OER content, that by negotiating with publishers to obtain some OER material I can massively enhance my own learning activities.In addition, the sustainability of OER as a concept is dependent on the development of business models. But this is not as straightforward as it may sound at first. There are a myriad of issues surrounding copyright when publishers start to think about releasing material. Part of the project, led by Hugh Look and Rightscom, is generating potential scenarios to consider as a team. For example, if I as an academic produce a book chapter with some material already licensed as my own OER (for non commercial reuse and repurpose) where does that leave the ownership of this material if someone else has already incorporated it into an OER? What can I/should I promise regarding ownership to the publisher? Quite a conundrum…. The other issue, and my main interest, is the pedagogical side. What do students want? We are trying to establish where the textbook sits within this new environment. 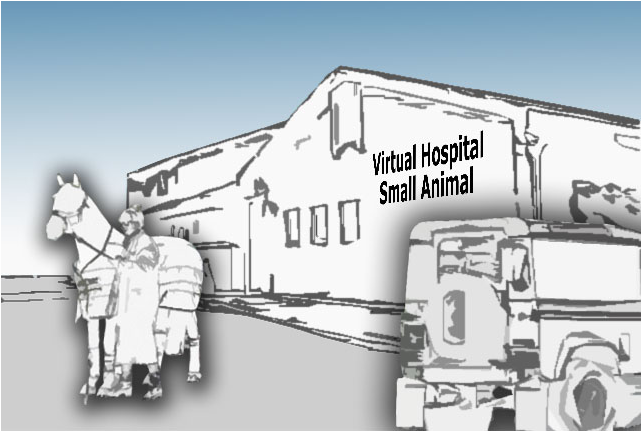 This is particularly interesting in the veterinary context – our students tend to be Google driven but textbook oriented, perhaps because of the difficulties of validation of online sources. I often see them using Google as a “quick look” method, and then accessing textbooks when they need “a bit more”. 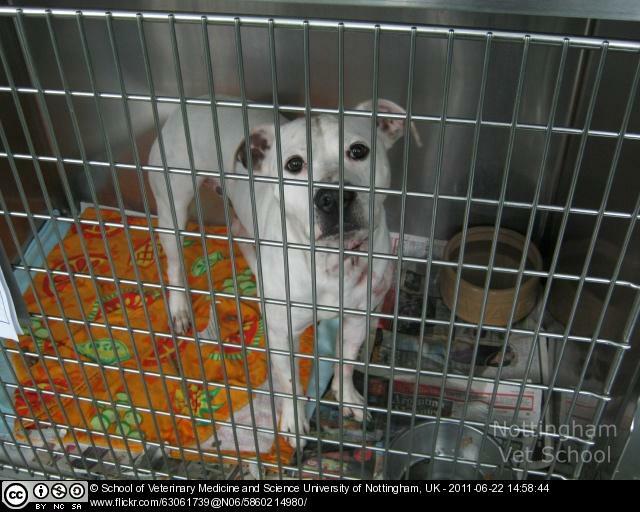 Of course, we also have WikiVet, a huge repository of veterinary OER – so we are working to trial some publisher donated content to see how this is used by students in various different contexts. This is something we started with the OVAL project, and is also being done in the OVAM project with a focus on anatomy resources. 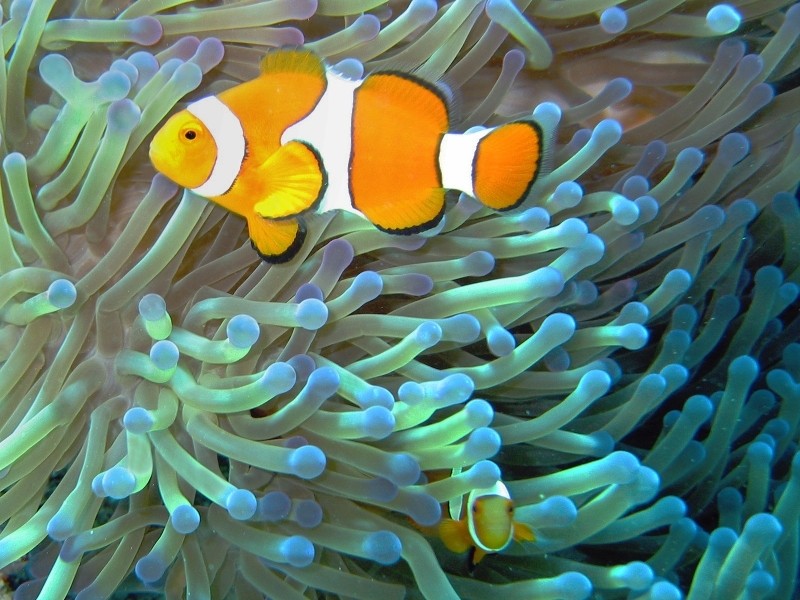 A symbiotic relationship like that of clown fish and anemone is an aspiration of the PublishOER project group, who are looking to create the same relationship between publishers and OER producers and users. This promises to be a fascinating project and the hope of a more symbiotic relationship between publishers and OER oreinted academics is a genuine one. Textbooks are not yet the chip wrappers of veterinary education – but the potential for this occurring increases as online content becomes more accessible and pedagogically sound. It is up to us all to work together and produce the best possible outcome for students, who will potentially be even less able to purchase expensive books in the future. OER may go from a “nice to have” to a necessity, and this is where PublishOER could really innovate. So today, inspired by a Tweet and blog post from @dratarrant, I decided to try out something I’ve read about a couple of times now – a back channel. I teach a lot of communication skills, and often use video clips in my sessions. This is tricky. I like to give the students feedback grids to focus them on what to look out for. But I think this is possibly restrictive to their learning. Although we teach Calgary-Cambridge structure, I am a firm believer that there is more than one way to skin this chicken, and a feedback grid can restrict them to looking for techniques, rather than appreciating a scenario for what it is, and giving instant reflections on what is unfolding before them. I thought the back channel might be a “freestyle” alternative. I’m lucky as all my students have laptops so its not a hassle to set up. We don’t have very good mobile signals on our campus so I can’t use the text wall service! I was teaching breaking bad news so used this clip, which is a medical one but I thought it would demonstrate the same principles to my vets as indeed it did. Did it help engagement? I’m not sure – students are generally quite engaged by video anyway. But the comments were interesting. I wasn’t sure what to do at the end, so I circulated the link on the VLE in case any of them wanted to review them and the clip. Any enhancements? Well ideally I’d do this with a Twitter hash tag, but the demographics are all wrong…I like this option as an alternative. I am doing @gasmanbax a favour – the ASPiH conference is on next week and they want to get people Tweeting during and afterwards. So we thought a “how to” guide was a good idea, and I volunteered to write one. Here it is – my question is what have I missed/got wrong? Thoughts much appreciated! Twitter is a social networking site which is increasingly used by professionals to form networks and share ideas. It adds an extra dimension to conference attendance. It is not just for teenagers to tweet about Justin Bieber, or for Stephen Fry to complain about his flight being delayed. Twitter is an excellent, free CPD tool. How does it enhance conference attendance? By using tweeting your ideas, questions, feedback, notes and thoughts during a conference using a specific hashtag, other Twitter users “following” that hashtag can interact with you. This results in discussion and reflection during and after the conference. It will provide you with an instant network of people with a common interest, who you can then continue to follow and learn from. If you have a smartphone, download the Twitter app. Or on your laptop, go to twitter.com. Create an account – register with your full name, but by all means be imaginative with your username (the president is @gasmanbax). Just don’t make it too long. Search for some people to follow. Some examples – @ASPIHUK, @gasmanbax (president), @gooddoctoruk (GMC), @nursingtimes, @SafetyNurse, @PtSafety1st, @PatientsafetyUK, @Atul_Gawande. When you follow someone with similar interests to you, have a look who they are following to get some more ideas. Hashtags are a way of highlighting the topic you are tweeting about to other interested people. During the conference, when you tweet make sure you include the conference hashtag #aspih2011. If you search for this hashtag in Twitter, you will see a full stream of everybody’s tweets. Save this search, and you can dip in and out to see what people are talking about. Follow anyone who looks interesting, and you will continue to receive their thoughts after the conference. The hastag #meded is commonly used by people tweeting about medical education, and #ptsafety for patient safety tweets. How do I reply to a tweet? If someone has said something interesting or controversial, or you would like to answer their question, then you can reply to them by including their username in your tweet. There is a reply function in Twitter which will automatically include their name for you, and if you are replying to multiple people you need to try and include everyone who is involved. When somebody replies to a tweet you will get a message on your smartphone if you are using an app. This tweet also appears in a special timeline on your homepage of Twitter. I can’t fit in all I want to say! Twitter is challenging with its 140 character limit – but in a way that is the point, as it makes you succinct! However, if you want to say more, there are a couple of options one of which is Tweetdeck. If you set up an account here you can manage your twitter feeds and tweet longer sentences which then appear in a link at the end of your tweet. Another alternative is to use Evernote, which allows you to Tweet your notes for people to comment on, for example. If you are tweeting links, use a url shortening service such as tinyurl to make it shorter. If someone tweets something which you think others following you might appreciate, you can retweet this message. You will see retweets appearing in the #aspih2011 stream. Sometimes people quote the tweet and add RT at the beginning as this allows a comment at the end. You should always include the persons twitter name in the tweet in this case. You might also see MT which means modified tweet – someone else’s tweets which you have changed and then tweeted to your followers. It is good Twitter etiquette to reference your sources! By tweeting interesting things! Twitter etiquette also says that if someone follows you, it is polite to follow them back. Make sure you complete your twitter profile as people will search for others with similar interests. If you become an active tweeter you will soon build a following. Yes – Twitter is completely public, apart from direct messages (DM). Always bear this in mind when tweeting. You should always get consent before tweeting photographs of people. The public nature of Twitter is one of its strengths, as it allows networking with people you may never come across otherwise. But this has been forgotten in some high profile examples (think Liz Hurley and Shane Warne). Using Twitter on your smartphone is not considered bad manners during a conference, but don’t be totally distracted by it – face to face networking is still vital! I am lucky enough to work in an institution which invests in eLearning and our team have some great tools which I make use of on a regular basis. It’s one of their inventions that I’d like to introduce you to, as I am often asked about it due to its rather visible presence on Power point slides. The funny black stripe contains attribution and license details - this is one of ours! Now I am generally a good law abiding citizen, but up to a couple of years ago I must admit that I was prone to “borrowing” the odd picture for presentations. And that’s not fair. Pictures on the internet still belong to someone, and even though I was always good at crediting the owner, and usually tried to get permission, this grey area of picture use was troubling. Sometimes you have moments as an academic that really make you content with the talent around you, and it was a moment like this, sat at my desk, when I was introduced to the stress-reducing powers of Xpert. I received an email from our eLearning team asking me if I thought I’d have any use for a tool which “searched the internet and found creative commons images and then downloaded them with fully embedded attribution”. Oh yes, most definitely, I replied. And so I tried out the first version of Xpert. Xpert searches for OER content across the web, and can find you all sorts of useful teaching material. But if you click on the magic media tab, you will find the black stripe impregnating implement which just makes life SO much easier. 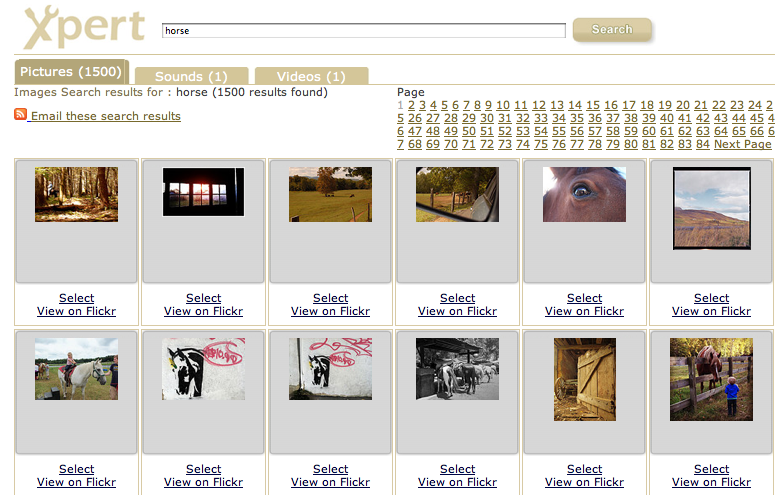 Type in a key word, or words, and it will harvest C-C licensed images, videos and sounds from across the internet. Scroll through the collection, check the license type, and download, with a nice stripe across the bottom telling you where it came from and how it is licensed. So no more forgetting if that is a safe image you have on your PC. No more worrying about recordings of your “grey” images making it onto student devices and beyond. Sometimes it is the simplest things in life that make it better, and this is certainly one of those things. Copyright is a complex thing, and my advice is a two pronged attack – a direct line to @glittrgirl (MEDEVs copyright queen! ), and www.nottingham.ac.uk/xpert as a favourite on your tool bar! I came across the concept of Open Educational Resources a couple of years ago, really via fringe involvement with the Wikivet project. Wikivet is as open source (tho you need a password as there is some sensitive content) learning tool for vet students and graduates. 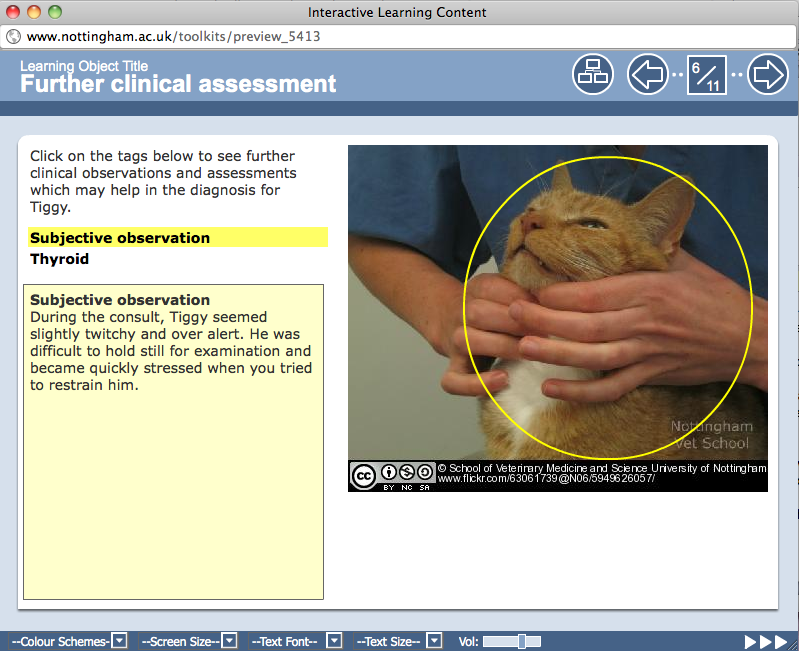 It started as a wiki, it’s now a whole heap of eLearning content – a really rich resource and a great example of collaboration between several UK vet schools. Where was I? Ah yes, well Wikivet started in 2006 I think, and I wasn’t properly involved until a couple of years ago when I joined the steering group as Nottingham’s representative along with my colleague Zoe. At the same time, I’d been approached by MEDEV about being involved in the OOER project, which was about consent and copyright issues. The next year was something of a conversion really – I’ve always been very open about sharing material I develop but all of a sudden, here was a way of doing it with a much bigger audience. Nottingham has of course been a real pathfinder when it comes to OER, and so unlike others, I felt fully supported as I endeavoured with various projects. WikiVet then had another JISC bid funded – the OVAL project, which has worked successfully with two publishers encouraging them to release content openly as part of WikiVet. It’s been a learning curve for the whole team, especially for the publishers who hadn’t even heard of Creative Commons licenses when we started! When I went to a JISC/OER conference about a year ago, all the talk was about users vs creators, and I had to agree with it – I was a creator rather than a user, and I hadn’t really explored resources other than those I knew of. People were using ours (Flickr gets about 40ish hits per day ) but other than the projects we had on the radar through WikiVet, I didn’t really know of others. However, a few weeks ago, I was contacted by someone asking us if they could our images in a vet ed resource (very polite, if unecessary as all are C-C licensed). So of course I responded, asking if we could link to the resources from WIkiVet and they said yes – they will make them C-C! So a great example of OER creating further OER, and I actually felt I had contributed and moved from something of a novice, to my first wobbly attempt at riding solo. Plus this is likely to lead to further collaborations with this team, who are keen on eLearning resources. In many ways this is what OER should achieve – it’s not just about great content for students, it’s as much about linking institutions – as we are all aiming at a common cause. I liked Amber Thomas’ recent blog post talking about visible and invisible reuse using the analogy of an iceberg from some speakers from Oxford (see pic). 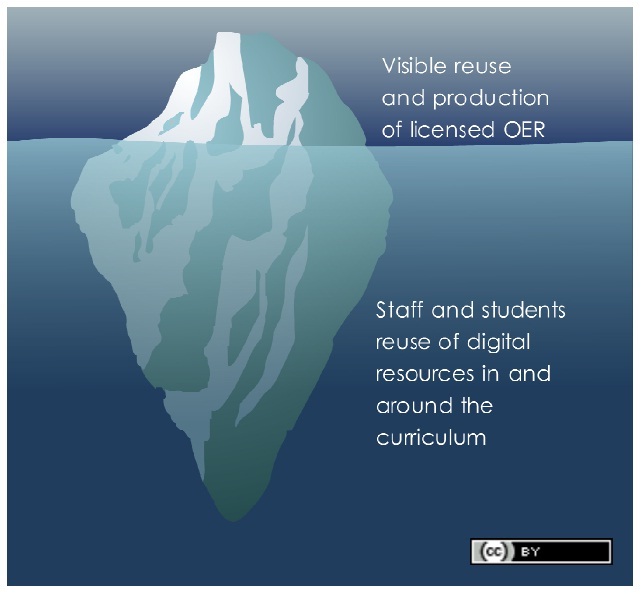 A lot of reuse is indeed hidden, but perhaps we (as in “local” user like me, not the JISC who already do a lot) should work more at encouraging others to centrally deposit resources, so that the exposed iceberg becomes bigger. One would assume some cumulative effects may occur! I will keep you posted on developments, meanwhile please follow my Twitter for links to some of our OER content from the OVAL project. So, I’ve just got back from two conferences – the NOVICE Summerschool in Budapest, and AMEE in Vienna. I always feel like I don’t make the most of conferences. I love AMEE – 3000 medical educators in one huge conference centre and multiple streams of symposia/workshops/posters/short comms….its absolutely manic! But as I sorted out some bits to take with me this year, I found last years conference bag, unpacked, still holding my notes and abstract booklet. Now I’m not saying I haven’t used what I learnt last year, because I definitely have (and made some new connections by sharing our business skills curriculum for vets in a poster), but it occurred to me that my physical output from it was rather static. It struck me that there must be a better way….and then I heard all these people talking about Twitter during a previous conference…and I had a bit of a rebirth moment. To me, as I gain in experience as an educator, networking is one of the most important elements of conferences. Its a bit like the lowest level of the EBM triangle, but the (often beer driven) conversations with new contacts are a brilliant way of learning and getting new ideas. However, face to face networking is such a small part of a conference (even a brilliant one with lots of interactive sessions) and so this is where Twitter comes in. – I tweeted questions/thoughts during sessions – and one of them even got asked live to the presenters at the time! As my notes are in Evernote they are a bit more permanent and so it’ll be interesting to see if I go back to them over the next few weeks. I’ve already sent the link to certain sessions to colleagues who I thought might be interested. So my conclusion is that CPD and conferences needn’t be as static as they sometimes appear….I guess I am completing that reflective learning cycle with a little help from some Twitter friends, and discovering that there is a fourth, social networking dimension to conference attendance! Tips for part time PhDers.....how a puppy helped me out!